Looks interesting. I'm surprised this made it to market without any any buzz whatsoever. It looks like they've updated the handguard and charging handle. Colt's website only shows a sku for the 308, but they are clearly making them in 6.5 CM as well. I think that these are very underrated rifles. My 901 is handy, relatively light and accurate (~ 1 MOA) with handloaded 155 and 168 gr AMAXs. I’d like to shoot one and see how it stacks up against the MWS, KAC, etc. It’s nice to see Colt back in the AR-10 type market. The 901 and other colt monolithic upper receiver guns were nice but violated LMT’s patents. Colt has weird marketing issues. It seems they promote products that are unavailable or ridiculous and when they do something right it’s like pulling teeth to get info. Last edited by HCM; 12-14-18 at 23:07. Actually looks like something I would like to pick up. Colt came out with the 901 before DPMS did the GII, and Colt inherited the updated small frame AR10A from ArmaLite with the sale of the Stoner patents in 1959. It's just taken over 40 years for the industry to realize what the ArmaLite marketing and engineering side did back in the 1950s after showcasing the original tool room AR10s around the world. I personally would lean heavily in favor of Colt's insight to meeting a TDP after all these decades, since they've had to go back and forth with the Arctic testing at Greeley across all their military models, and have cross-pollinated those little nuances into the build quality of their AR pattern rifles. The 901 still has a large diameter BCG up front, but it is much shorter, allowing for the receiver set to be close to an AR15. The guide rails of the carrier on the 901 are really short, so that it can penetrate into the RET without impacting the RET boss. Both the GII and the 901 have about the same length receiver sets and BCGs. I've broken them down and compared the 2 side-by-side. 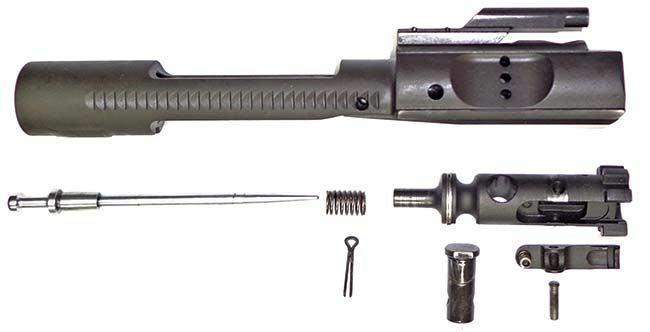 The GII uses a slightly longer AR15 diameter carrier so they could duplicate an M4's receiver height, while employing an intermediate diameter bolt head with an 1891-era Fosbery shotgun style bolt lug arrangement. The GII also has a forged tower with a tube insert to replace the carrier key. If Colt adapts to the current market trends and direction, they should be seeing more sales with the 901 series, but a lot of people just don't know about them in the sea of cheap imitation, customer beta-test FAKAR-10s and parts that are all over the map in terms of following any kind of universal datum, even for magazine compatibility within what are supposed to be SR25 pattern mags. I've never had the chance to compare a Colt and a DPMS side-by-side but I've shot and handled both. What really impressed me about the DPMS is that it really doesn't feel much at all like an AR10. Where most AR10's feel like an AR15 that's been generally "swelled up" about 10% in all dimensions the DPMS really feels like an AR15 with a big magazine well. Same rail height, etc.